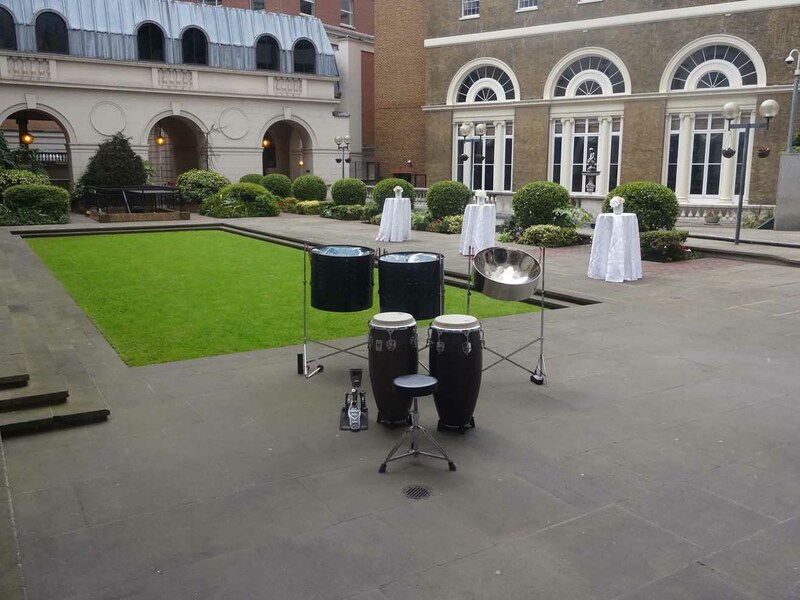 Big Sand Steel Band | Steel Band Hire | Steel Bands London | Live steel drum band for parties in London, Hertfordshire, Surrey and many other areas. 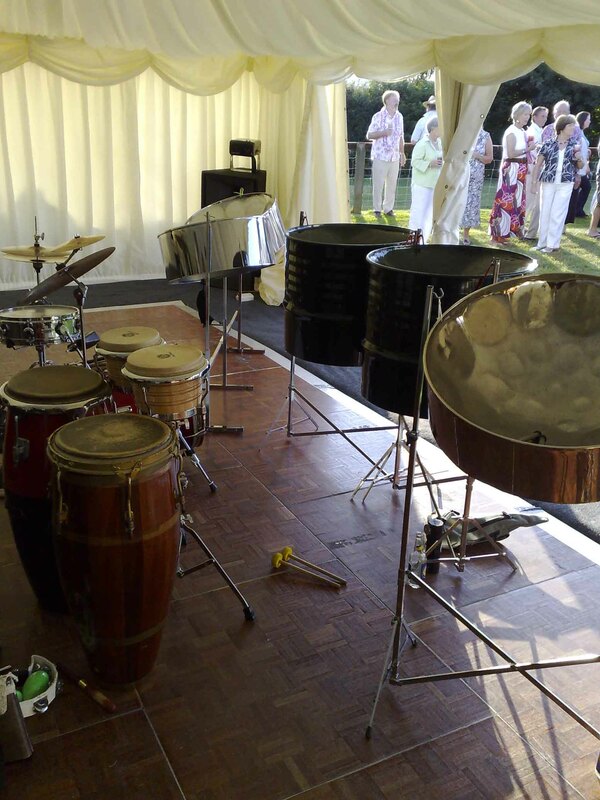 Our band is one of the most established steel drum bands for hire and has some of the best players. More important, we have covered many events and you can rely on that experience. We offer a vibrant 5 piece band (image below) for clients who have the budget and space. The 5 piece band is a real treat for parties and events, imagine how it would sound at your party after hearing the demo. You can expect a seamless service from the moment that you send your inquiry, receive the quotation with terms etc, right up to the end of the performance. For clients that hire the more vibrant 5 piece band, they will enjoy the benefit of 2 additional cylinders to power a highly tuned machine. 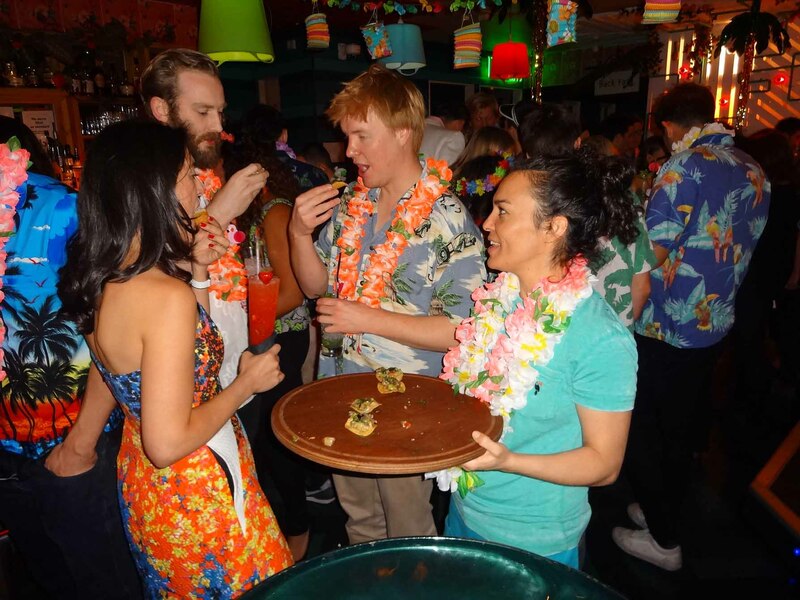 Lots of reggae, lots of calypso and lots of fun if you are hosting a Hawaiian or Caribbean themed party. However, 80% of bookings are covered by the 3 piece band because of the scale of the party or event. This option provides an uplifting and melodic repertoire as background music during a drinks party or wedding. 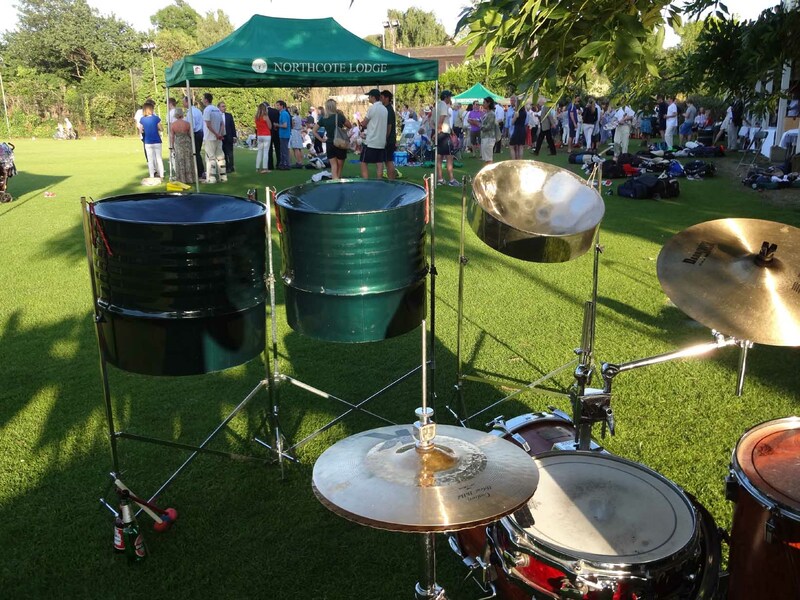 What is different about our steel drum band? Our players, equipment, presentation and performance are developed to impress the most discerning clients. As expectations of clients have risen, our entire operation has rebooted to meet those demands. Below is a family fun day at a cricket club. 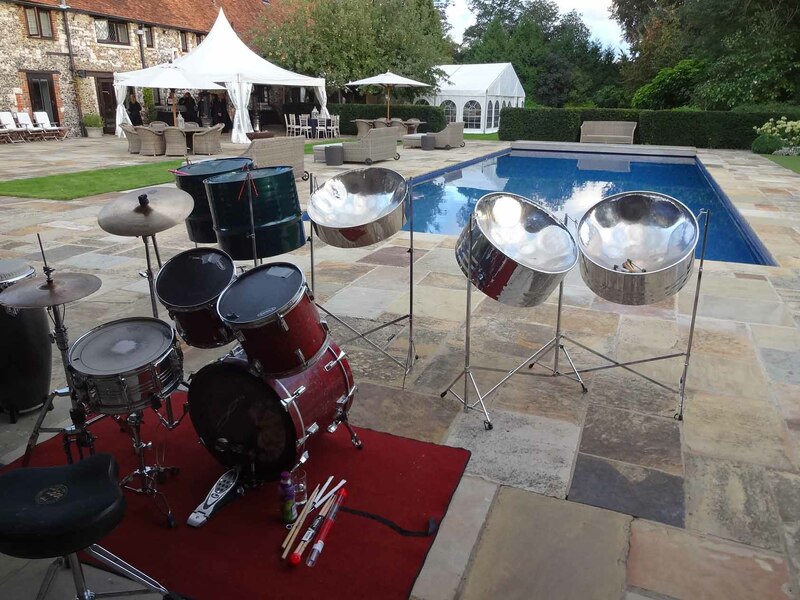 Below is the 5 piece band awaiting the arrival of 200 guests at a party in Marlow. Below is a company networking party near Blackfriars Bridge, we used 3 players and ensured that the sound level was just right to create the perfect ambience. Below is another company party where our 3 players covered just the drinks reception as guests were greeted with a glass of strong rum punch. Below is a terrace party in the City of London. Online, we have an extensive footprint throughout #SocialMedia and you can follow us on Twitter/bigsands. All social media and marketing communications are managed by the band's leader who is nicknamed Bigsands. Email responses are within 24 hours during the busy season. There is a minimum chargeout rate and our pricing is very consistent for all counties that we cover. If you send an inquiry from the contact page, we will understand your requirements and provide details about the cost. Most of our bookings are to provide quality background music for a drinks reception, usually for around 1.5 to 2 hours and this forms the basis of our pricing strategy. The 3 players ensemble covers over 80% of bookings and is the most requested format that we use. 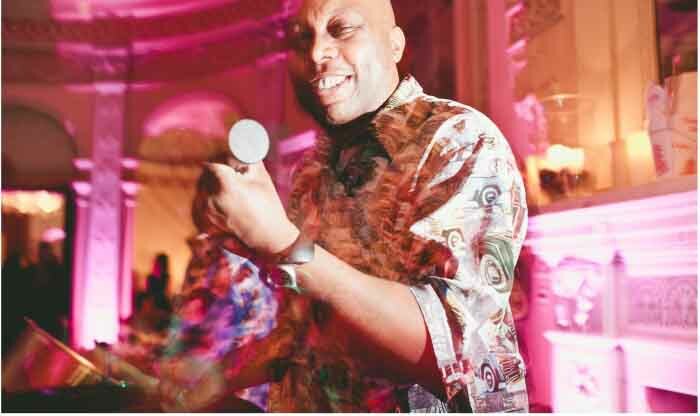 You can expect to be taken on an exciting melodic journey characterised by real steel band DNA from the Caribbean, this means real musicians performing live music without backing tracks. Compare our live music with other steel bands and book with full confidence.